The Bow of Hart Saga continues in audiobook on Audible with the follow-up release to The Bow of Destiny. Podium Publishing has scheduled the audio release of An Arrow Against the Wind on 10/23/2018. The cover is now public along with the pre-order link. Haunted by his past. Hunted in the present. Buffeted like an arrow in the wind. The hunt for the Bow of Hart continues for Athson and his companions. They have escaped the clutches of Magdronu and Corgren, the mage, but they are still pursued. In need of answers to deep mysteries revealed in Chokkra, Athson must gain possession of the mythic bow to face both his enemies and his tragic past. But Magdronu’s reach stretches among Athson’s companions, endangering Limbreth and even Hastra in schemes to entrap them all. With each turn of the search for the Bow of Hart, long hidden secrets surface that threaten to destroy Athson. Will he falter like an arrow against the wind? Readers can now take advantage of Whispersync to listen to the book while traveling. Find out more about narrator Tim Bruce at his website. 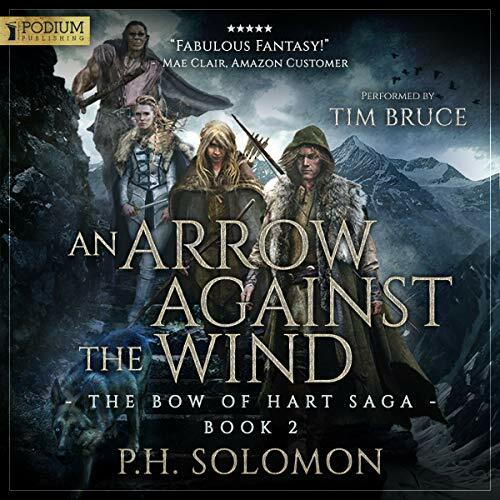 Special bonus courtesy of Podium: Check out the free audio edition of The Bow of Hart Saga: Prequel Pack on AudFans! Reblogged this on Where Genres Collide.